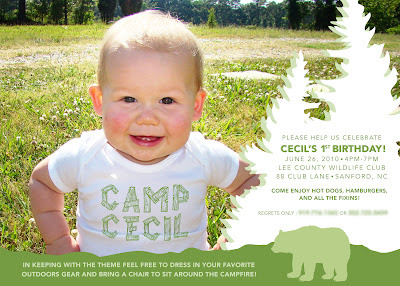 Meanwhile, I pulled together this invite for Emily's nephew's first birthday party - they are doing a camping theme, and from the sounds of it they are going all-out. It sounds like it's going to be super cute! She had some ideas already for the invitation, fortunately, so I was able to get this out the door with only a couple hours of time... all I seem to be able to afford these days. Fun project for my free time, especially because he's such a cute little boy!! Ta daaaaaaaa - Wedding Invites!